1 Blend Hellmann's® or Best Foods® Real Mayonnaise, cream cheese and red food coloring in large bowl with wire whisk until smooth. Stir in marshmallows, fruit cocktail, walnuts and cherries. Fold in whipped cream. 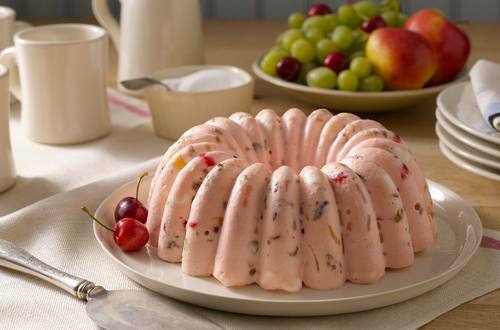 2 Spoon mixture into 10-cup decorative ring mold or Bundt pan. Freeze 30 minutes or until firm. Unmold onto serving platter.